Is this less visibility for your local business? A major change in Google’s local search happened this past summer … a new way of listing local businesses in search results was rolled out, changing the previous “local 7-pack”, where seven local businesses were featured, to a trimmed “local 3-pack” view. What has actually changed in local SERPs? Do these changes mean less visibility for your local business? How to adjust your local SEO strategy? The update that rolled out simultaneously in the USA and internationally, has drastically changed the look and feel, plus the navigation within the local packs. So, let’s have a closer look at the new local listings. Only 3 businesses displayed.Before the update, local listings were shown in packs of 3, 5 or 7, meaning that more local businesses had a chance to squeeze in to the first search results page, even if they didn’t perform well organically.A move to 3-pack listings obviously makes competition for page-one listings even harder. No business addresses and phone numbers.Google has also removed the phone numbers and exact addresses from the listings, instead only showing the name of the street where the business is located. So, unlike before the update, searchers are no longer given your business contact information upfront and need to look for it on their own. No flyout business cards and “Google my business” links – all clicks lead to a list of competitors. Going even further, Google not only removed contact info from the initial view, but also disabled all 1-click ways to access it. All links to Google My Business pages were removed. And local cards (that previously popped up when you scrolled through the 7 pack listing) got hidden. Now, clicking on a listing opens a new search view with a map, a list of 20 competitors, and a version of the old local card. Sure thing, it’s too early to make grounded conclusions, and the real impact of this update is yet to be seen (as well as some adjustments to the new local pack, as the mechanism itself seems to be quite buggy and unstable). But while at first glance the update seems to make life only harder for local businesses, in reality there may now be MORE exposure opportunity for MORE businesses. The top-3 local results are in rotation — depending on the searcher’s physical location. In the in-house test over for the past few days, we’ve compared local results for “Plumbers in Seattle”, each time browsing Google using 10 different Seattle IP addresses. In each of the locations we were getting at least slightly different results, which showed that 2 searchers standing just several miles away from each other will probably see different local packs in Google. For example, one and the same business, Beacon Plumbing, that ranked 3rd for a search on 13th Ave S, Seattle ranked only 8th (on the map view) for a searcher standing 5 miles away. 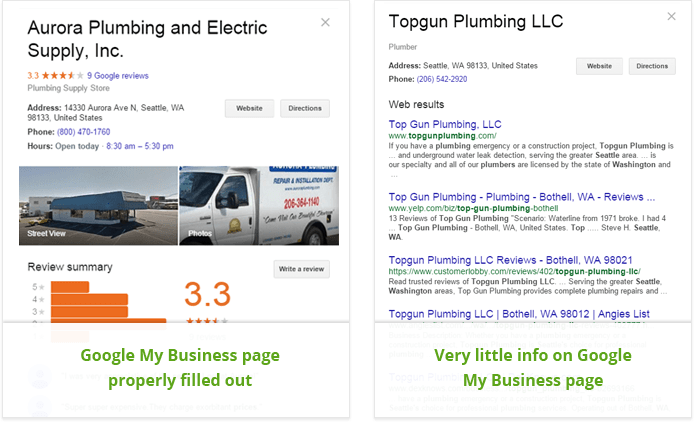 On the other hand, Fox Plumbing & Heating that didn’t show up on the SERP for the first searcher, was served in the local pack for the second searcher. More searchers will navigate to the map view with 20-business list. With many of the older navigation options disabled – including Google My Business links and flyout business card – now, instead of instantly picking the right business on the SERP, the searchers need to switch to the new 20-business map view to dig out the contact information and addresses of the businesses they got interested in. Thus, even if you weren’t listed on the SERP, you still get a high chance of being noticed. More searchers will stick to organic results. As countless CTR studies show, a huge percentage of searchers find organic results more trustworthy, trying to avoid any “alien” results on the SERPs. And now, while the redesigned local pack looks even less like the organic snippets, chances are that more searchers will stick to organic results. Thus, if you don’t perform that well in local listings, there may be even more opportunity to earn organic traffic either directly to your websites, or to your business pages in the Yelp-like directories. This being said, how can YOU adjust your local strategy to the changes and make the most of the new local listings? Here are a few suggestions we’ve got. Google’s local packs depend on the searcher’s IP so much that you and your neighbor could literally be getting different results for the same query. These fluctuations are something that is really hard to track for a rank checking tool. So chances are that you are showing up in the local 3-pack to many actual searchers, even though your ranking report doesn’t show that. Check if you’re showing up among the top 20 sites on the map view. Another thing we noticed while experimenting with Seattle IP addresses was that for all the different tested locations in Seattle, the list of top-20 websites on the map view remained almost the same — with websites simply being re-arranged depending on the searcher’s physical location. This probably indicates a more even distribution of search visibility between those 20 lucky businesses — with each of them getting a portion of displays from searchers from a particular geographical location. And this, in its turn, may mean that it’s time to change the ROI variables for your local SEO, switching from “the exact rank in local pack” to “being/not being listed in the top-20 map results”. Already listed in Top-20? Work harder on a compelling snippet. A searcher spotted you in the local pack? Great, but while digging for your phone and address, they will also see a huge list of your competitors. Keeping your snippet better than theirs is the only way to ensure that the potential client sticks with your listing. Not showing up in the top-3 local pack? A compelling snippet can still help you win searchers’ attention and steal potential customers from your competition! A link to your Google My Business page is no longer available for searchers, but most of the info for your local business card (including your address, phone number, images, street view, etc.) is still taken mostly from that page. 1. Add a long, unique description that’s formatted correctly and includes links. 2. Choose the correct categories for your business. 3. Upload a high-resolution profile image and cover photo. 4. Upload as many photos as possible. 5. Add a local phone number to your listing. 6. Add your business address that’s consistent with the address on your website and local directories. 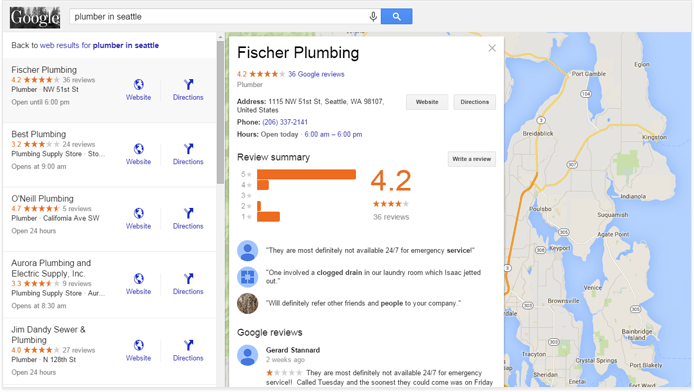 Though no longer called Google reviews, the reviews from your Google My Business page are still used for local pack snippets. More to that, the business card itself includes not only your overall review rating, but the number of bad reviews you have as well. If you are in the restaurant business, your ratings are going to become even more crucial. 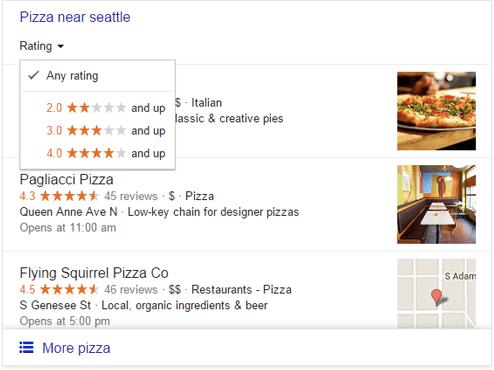 Google has added an option for searchers to select only businesses that are above a certain rating. Each local listing’s snippet now includes the business’s working hours. Depending on the time they run a search, the searcher sees ‘Closes at ___ ‘, ‘Closes soon’, ‘Opens at ___’, or ‘Closed now’, so make sure to indicate your company’s correct opening hours on your Google My Business page. Not yet listed in Top-20? Stick to the good old local SEO techniques. Keep in mind that the recent update was not an algorithmic change — nothing has changed in the way Google determines the most relevant businesses to show. And this means that all the good old local SEO truths still apply. Follow the guidelines listed above. You need to ensure that you have your full NAP (name, address and phone number) on every page of your website. Furthermore, you must use the exact same details/format when you mention your address on other websites (i.e. local citations). So try to fix all the incorrectly formatted citations and earn new ones with proper NAP listed. Business reviews have a direct impact on local search rankings, so you need to spend some time acquiring them. And these are not only Google reviews, but also reviews on your Yelp page (currently used by Apple maps) and other local directory pages. 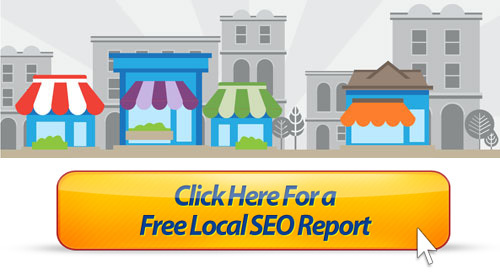 Link building within local SEO campaigns is incredibly important. Compared to standard SEO campaigns, local SEO relies much more on links from other local websites that are really relevant to your business. Another crucial SEO factor for local listings is your pages’ content, so try to squeeze the most value out of it. Embed a Google map with your business marker into your landing page. For most of local queries, top 10 organic listings feature many results from Yellow pages and Yelp-like directories. That means that besides focusing on driving search traffic to your website, you can earn some visibility by building a solid business presence on leading local directories in your industry.